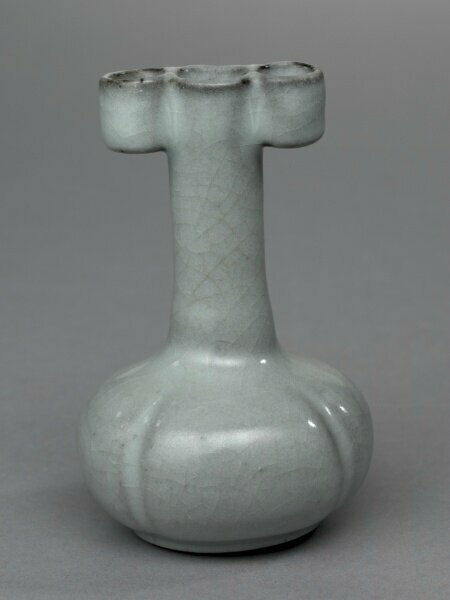 Arrow-Holder Vase (Jianhu), 1200s, China, Zhejiang province, Hangzhou, Southern Song dynasty © 2013 Cleveland Museum of Art. Arrow-Holder Vase (Jianhu), 1200s, China, Zhejiang province, Hangzhou, Southern Song dynasty (1127-1279), porcelaneous stoneware, Guan ware, Diameter - w:7.90 cm (w:3 1/16 inches) Overall - h:12.40 cm (h:4 7/8 inches). Gift of Mr. and Mrs. Severance A. Millikin 1957.65, Cleveland Museum of Art © 2013 Cleveland Museum of Art. Commentaires sur Arrow-Holder Vase (Jianhu), 1200s, China, Zhejiang province, Hangzhou, Southern Song dynasty © 2013 Cleveland Museum of Art.